Editors Keep an Eye on Your Small Business - Mischa Communications, Inc. Mischa Communications, Inc.
Typos, while certainly undesirable, won’t have a long-lasting effect on your small business, right? A couple of transposed letters or an extra space between two words or a simple misspelling won’t make or break you … right? Macy’s knows the pain of a poor edit all too well. In 2013, the department store sent out a mailer offering a $1,500 silver necklace for $47. It’s a great deal, right? Well, it was – for everyone but the store, who had meant to sell it for $497. There are no concrete facts and figures on how much the store lost before the error was corrected. But it was a lot. Macy’s survived because it’s a multibillion-dollar business. A small business might not have been so lucky. Proofing your own text isn’t easy. Your eyes naturally skip over your typos because you already know what you mean to convey. It’s not that you’re being careless – it’s simply that your brain is too intent on the meaning of your text to focus on mundane things like spelling errors or duplicate words. While there are ways to help you increase your proofing productivity (reading it aloud, reading it backward, etc. ), there’s really no substitute for a good editor. Your words aren’t the only thing that need to be reviewed. Be it a logo, billboard or promotional photo, your graphics (Photoshopped or otherwise) can cause quite a stir – and not in a good way. So make sure your editor is proofing all of your small business’ marketing materials, not just blogs and social media posts. If there’s something inappropriate, embarrassing or off about it, you can be sure your audience will find it…and possibly plaster your “oops” all over the Internet. Shoddy editing can cost you more than time and money – it can also wreck your small business’ credibility. If your materials aren’t up to snuff, what guarantee does a potential customer have that your product or service will be any better? A business that frequently sends out incorrect or error-prone materials quickly earns a reputation for being subpar. Over time, your mistakes can become as much a part of your small business brand as your name, tagline or phone number. Don’t be “that” small business! 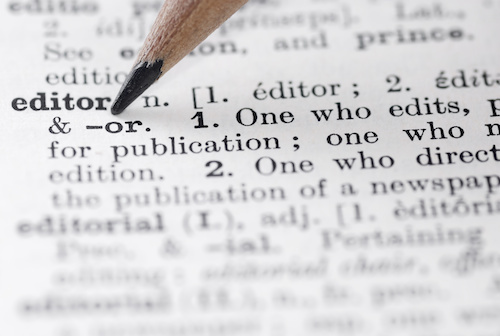 Mischa Communications’ eagle-eyed editors can make sure your customers focus on your small business – not your typos. Drop us a line to put our grammatically correct skills to the test. Who Has What It Takes to Be Your Small Business’ Ideal Customer?